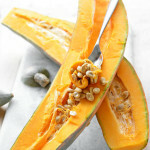 Confession time… I’m totally crushing on blue hubbard squash. Don’t tell my husband! After all, it’s just a squash. This post is the second in my All About Strange Vegetables series. 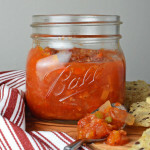 (Check out my last post All About North Georgia Candy Roaster Squash.) If you want to learn more about this big mother hubbard keep reading! Heirloom variety with debated origins. According to James J. H. Gregory, who first marketed hubbard seeds, in his book Squashes and How to Grow them (1867) he mentions two stories. The first is that an elderly woman told Gregory that she remembered tasting the squash when she was younger, which was first brought to Marblehead, Massachusetts by a man with the last name Green. The second story is that Elizabeth Hubbard, the Gregory’s wash woman, got the seeds from Captain Knot Martin, which she then gave to Mr. Gregory. 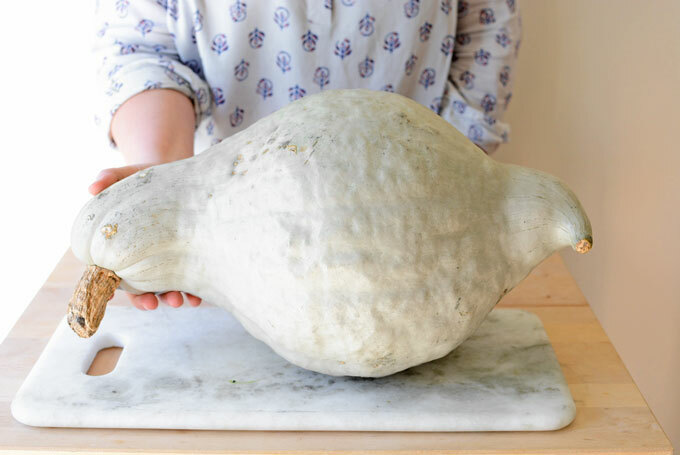 There is another account (1981) of blue hubbard squash according to Louise Martin Cutler, a Marblehead historian, who claims that her great aunt Sarah Martin, sister of Captain Knot Martin, developed the squash with her sister Martha. She was shy about approaching Mr. Gregory with the seeds, so she gave them to Elizabeth Hubbard to present to Mr. Gregory. Smooth texture with a sweet and nutty-tasting flesh. 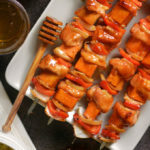 Substitute in recipes that use pumpkin, butternut squash, or sweet potatoes. This squash can be baked, roasted, and steamed. Make into a purée and use like puréed pumpkin in breads, pies, or pasta dishes. 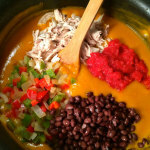 It’s also a delicious addition to soups, stews, or casseroles. Pairs well with flavors like chipotle, chili, cinnamon, nutmeg, curry, sage, and brown sugar (I know that’s not a spice, but it works here). See pictures below… It ain’t easy! 15-40 lbs. Yes. 40 lbs. That’s not a typo! There is the large variety, pictured in this post, as well as the baby blue hubbard which weighs in at a mere 6 lbs. They taste very similar, with the smaller variety being a little sweeter. The baby blue hubbard has been seasonally available at Whole Foods Market. You can also get this squash from local farmer’s markets or CSAs. I’ve seen it available in the “ornamental” section at a couple of pumpkin patches… If only more people realized that it’s better to eat than look at! Harvest in the fall before hard frost hits. Cut a stem that is about 1 inch in length and allow the squash to cure in the field for 5-7 days before bringing inside, making sure to cover it if frost is forecasted. This squash winters well for up to six months. It’s January and I just enjoyed one that was harvested at the beginning of October! I actually go for more of a controlled drop – slamming it on the ground with a little help from gravity. 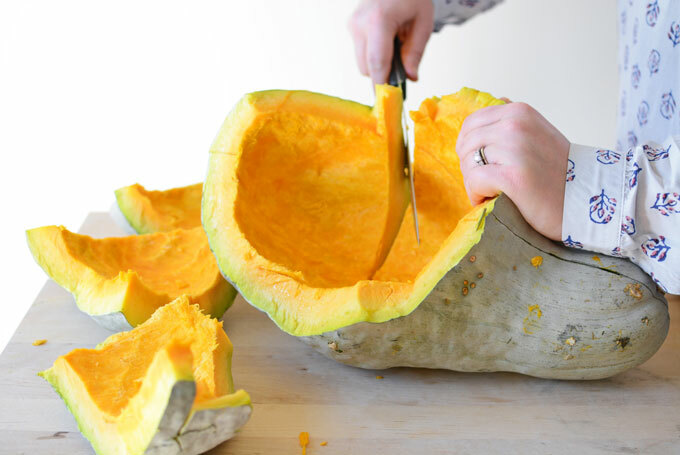 It cracks the squash right open without having to go out to the shed for your saw. Plus, it’s good for stress relief. Just be prudent about the surface you choose. Probably not a good idea to be doing this on your hardwood floors. Once you get this thing open you reveal a beautiful golden center. To prep, remove the seeds – which can be saved and roasted like pumpkin seeds. 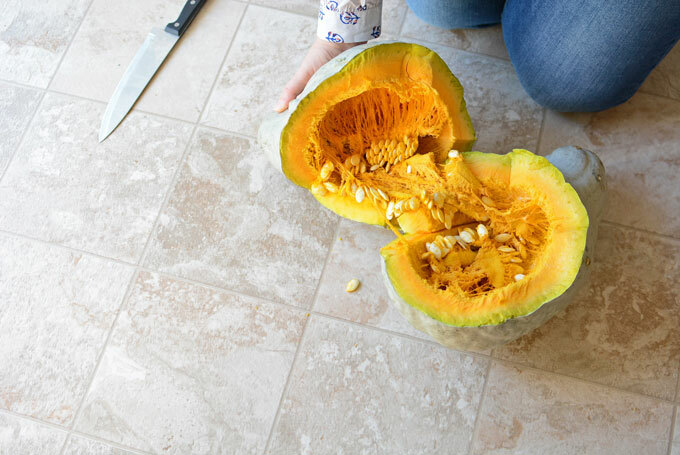 To break into smaller pieces, cut a small slit into the squash with a sturdy knife and and rock it back an forth. This will cause the squash to crack further instead of having to try and cut through it with brute force. 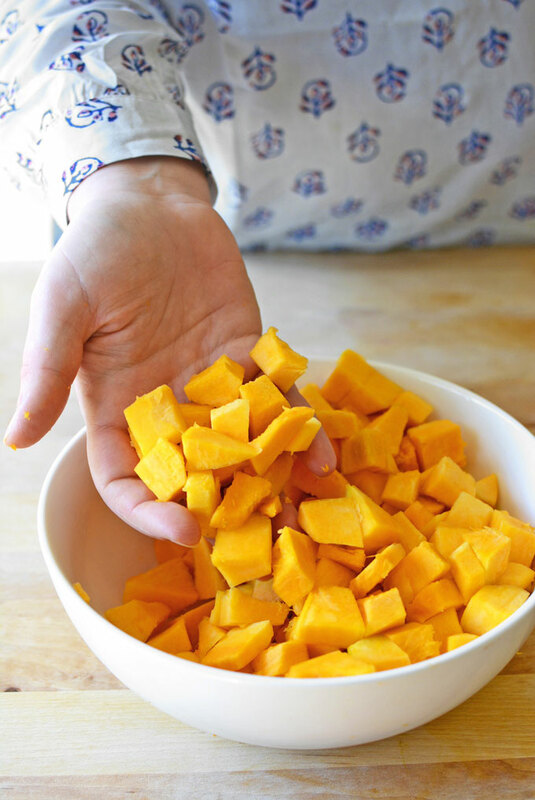 You can roast the squash pieces at 350º F for about 45 minutes, or until the squash is soft, seasoning it as desired. If you roast it plain, you can also purée it in a food processor, and the then use it like pumpkin purée (check out my post How To Make Pumpkin Purée for more details). Alternatively, instead of roasting the pieces you can also cut the raw flesh away from the skin and cube it. Enjoy it sautéed, baked, or in a casserole. I love strange fruit and veg! 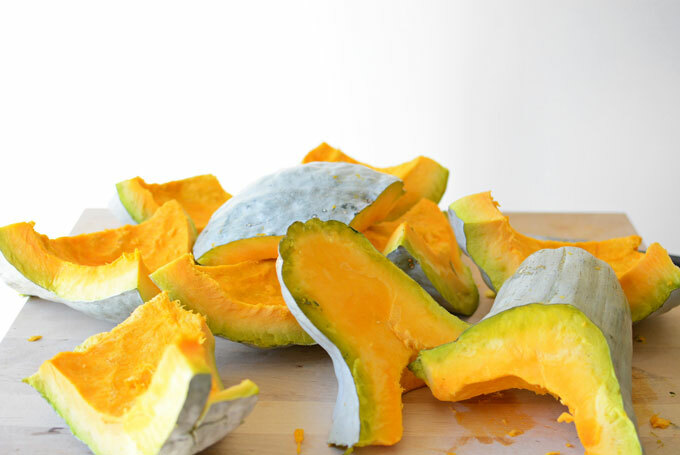 Thank you for showing how to break open the squash – I was wondering that since the moment I saw the post image. lol Glad to hear I solved a problem for you! And it’s so much fun to throw a hubbard isn’t it?! I’m happy to hear the tip worked well for you! What is planting in a mound? Sounds pretty straight forward but you can never tell. It’s probably exactly what you think it is. You make a mound of dirt and then plant the seed in it. It aids with draining excess water away from the seed to maintain the right moisture balance. Don’t recommend dropping heavy Hubbards onto breakable floor tiles!! A big cleaver and rubber mallett will also do the job (and leaves a relatively even cut so you can lay it down in the over to bake/roast). Haha! I’m glad to hear that my cheap linoleum flooring had you fooled! A big cleaver and rubber mallet would totally work, but I dare say, decidedly less fun. And I was just about to suggest the exact same thing, ‘cos it’s what I’mma do with the ten-pound Hubbard that’s currently sitting in the sink waiting for me to come see about it. Haha I love that you just chuck in on the ground. Smart! 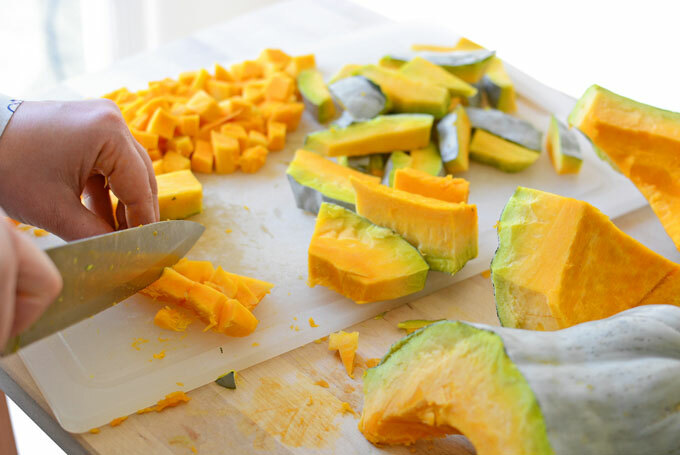 I’m never strong enough to cut any kind of squash…now I have my solution! Great post, Rachel! 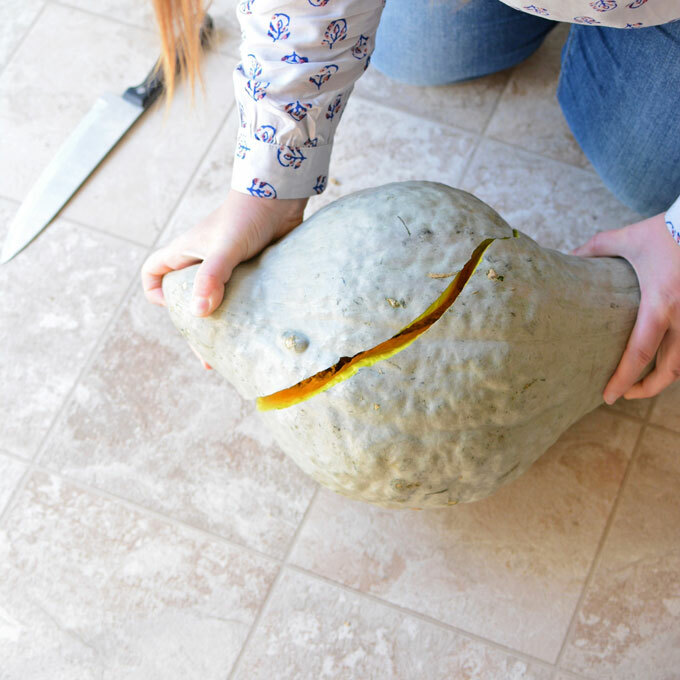 Getting into winter squash can be tough. 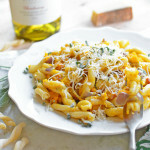 If you have trouble getting into butternut check out one my older posts where I talk about a hack of actually microwaving it briefly before breaking it down. It makes in easier to peel and cut. When I’m dealing with a large squash or pumpkin I often roast, puree and freeze it. Blue hubbard makes a mean “pumpkin” pie! That’s a whopper of a squash. We eat a lot of them. They are one of our favorite veggies. I glad to hear someone else appreciates this delicious squash! That is one beautiful huge squash. I wouldn’t even know where to begin with that thing lol. I have never made squash before so thanks for showing readers how to open one up. I’m going to pin this one. Thanks for pinning April! Just remember to drop it and you’ve got this squash handled! I love learning about odd fruits and vegetables. And one that you can drop on the ground to open! Count me in. Besides it sounds delicious and I love the types of squash that you said it can sub for. A dare say it’s yummier than the squashes that your can sub for. It’s so smooth, sweet, and wonderful. Plus it’s way more fun to open than say a butternut! We eat a lot of squashes, but I have to confess that I’m one of those who thought this variety was purely ornamental. Now that you’ve given me all this great info though, I am definitely going to be on the lookout for one, if only for the stress relief chucking that sucker to the ground could provide. (I’ve been directing my fourth graders in a play for the last three weeks. It’s like herding cats.) Thanks for your thorough post. My word! Fourth graders! In college I worked as a summer camp counselor and there was so much drama (not the play kind of drama) to be had with the fourth grade girls. I feel your pain! 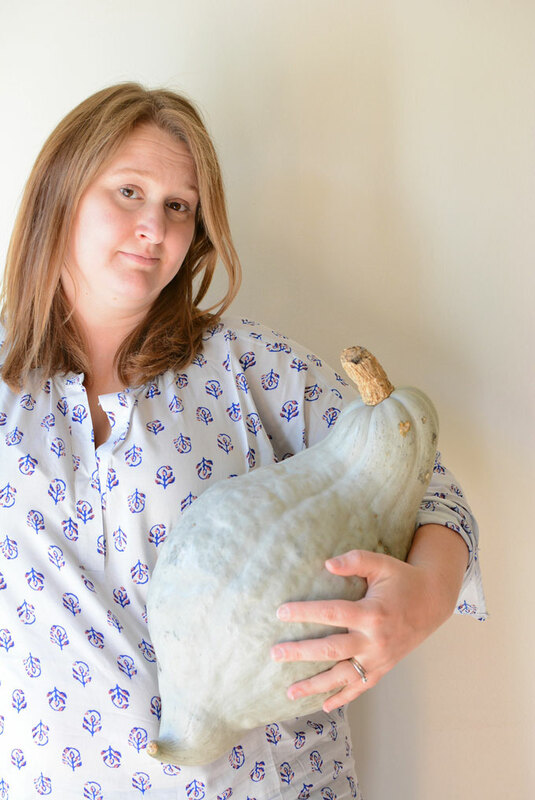 If you can’t find a hubbard, throwing any large winter squash should do to help with stress relief! We have had a great harvest last year and stored our hubbard squash for quite a while and we are about finished cutting the rest up for freezer storing. We have a very large one that looks great on the outside and the flesh is yellow orange, however there is white meat on both ends instead of orange. Doesn’t smell bad, nor does it look bad. Is it eatable? Thanks for any help you can give us. Hey Linda. I would just cut away the yellow ends and you should be good to go! I’m so jealous that you’re still enjoying blue hubbard in May! Happy cooking! I have been enjoying Hubbard squash for many years. When my kids were growing up, I passed it off as pumpkin pie, as I thought they wouldn’t eat squash pie. Now, in their thirties, they won’t eat anything but squash pie! Lol! I do have one question, though. I have some huge Hubbard in my garden already (mid August). Is it possible to harvest the big ones now so the smaller ones can keep growing? Thanks! What a cute story about your family’s blue hubbard tradition! As far as harvest this squash, you can get two harvest. For the larger ones, cut them carefully from the vine two inches above the squash. Leave the others in the garden until they mature, but be sure to harvest them before heavy frost hits! How long would you roast and at what temperature? 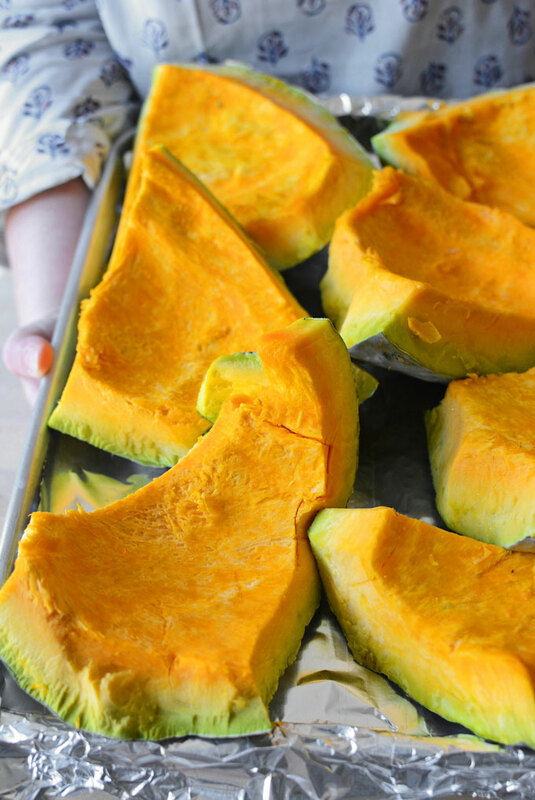 Hi Shannon, Rachel says in the article that you can roast the squash pieces at 350º F for about 45 minutes. I was so excited today to find all the “heirloom pumpkins” marked down at my local grocery store. They were selling them off from their halloween/fall decorations. I am hoping to go back when they are marked down even further in the next couple days and buy all they have! 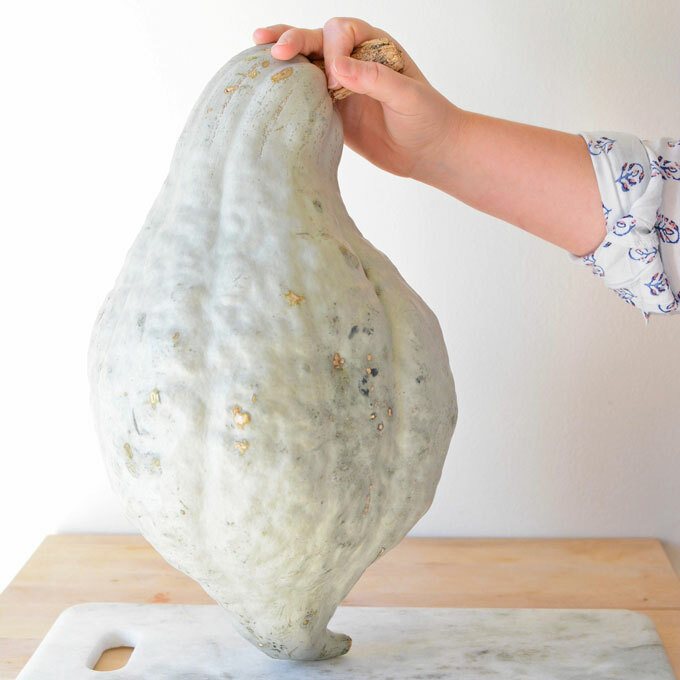 Thanks for a well-written post – now I know how to prepare and eat this mammoth squash! Dawn- Thanks for answering Shannon’s question! Best of luck with your “heirloom pumpkins. I’m so happy to hear that you found this blog post helpful! Haha! It’s great to hear that there’s someone else out there who’s throwing the hubbards around! It sounds like your butternut hybrid should be the next big thing in the gardening world! Thanks for your instructions on baking hubbard squash. 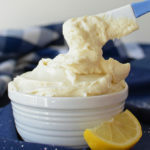 I found a big one at the farmer’s market – about twice the size of the one in your pictures, if not bigger – and couldn’t remember where I’d previously found instructions for baking. 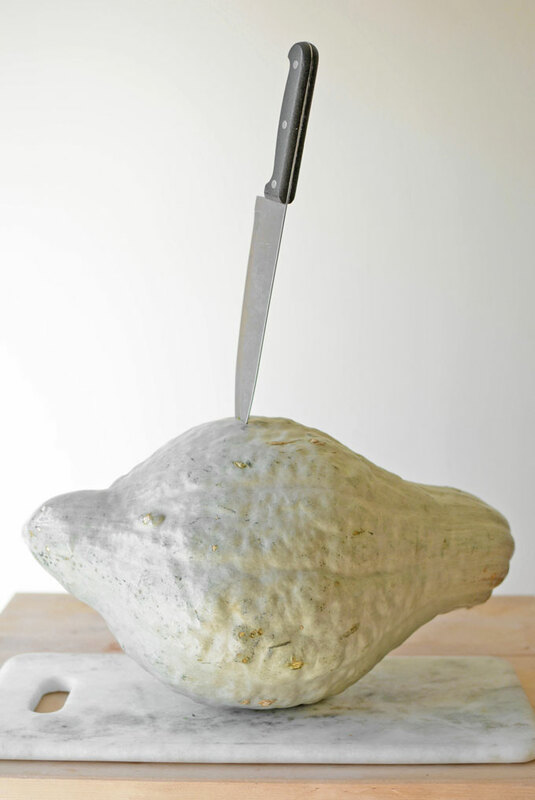 As tempting as throwing it at the ground was, I have a short but strong knife and strong hands from years of typing, and had a good time carefully “stabbing” the squash. I also have a melon scraper (picture a handle with a stiff round plastic loop about 3 inches across) which works great for scooping out the insides, then scraping the cooked flesh off the rind. I ended up with 10 freezer bags of pureed squash, containing 2 cups each (pre-measured for easy baking). Of course I saved and toasted all those lovely big squash seeds, as well. I left it on the front porch for a few weeks until I was ready to tackle it, and the kids who came around trick-or-treating on Halloween wanted to know what was going to hatch out of my “alien seed pod”! lol I’m so going to copy you and put an “alien seed pod” on my front porch next Halloween. I love in a big neighborhood where well over 100 kids come through, so it will certainly be appreciated! Thanks for sharing the idea of the melon scraper. I don’t own one myself, but I think it’s going on my wish list for next season! That’s hilarious! I should totally do that with my kids and once Halloween is over I can still cook with the hubbards! I’m sharing this with my sister-in-law because we both were gifted a blue hubbard. Mine weighs 17 pounds! I was going to have my husband go at it with his hacksaw, until I read your blog and learned the (ahem) proper way to get into one of these babies! 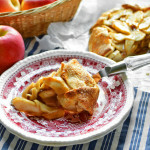 Pie, soup, and roasted squash for the coming months…. 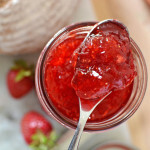 yummmie!!! So…. today was Hubbard day. Wow, what fun!! I’m roasting the pieces for a short while at 350, about 20 minutes, and plan to cut the flesh off the rind after that. i want to use it for sauté. And maybe for further roasting. Sounds yummy! Happy Hubbard Day! YEARS AGO…..My daughter found a green tall pumpkin, a round red pumpkin and a very large hubbard. She created Larry the Cucumber, Bob the Tomato and Barbara Manatee from Veggie Tales …. amazing but if you put a bow on a hubbard and paint a smile on it. looked just like the character!! ALL THE LITTLE KIDS loved our cartoon character Veggie Tales creations!! Jill, this is great! I should do this with my kids next fall. They would totally get a kick out of it! Hi Rachel, just dropped and busted my first Hubbard squash. Its in the oven roasting on its way to being a pie for our thanksgiving feast. Thank you! Easy and Terrific idea! I’m so glad to find your blog! I work at Whole Foods Market and I couldn’t resist buying one of these bad boys for my fall porch decor. The produce team leader told me not to throw away “chunk it” after Halloween as it cooks beautifully . Now I know I can literally chunk it to create delicious recipes. I’m headed to my porch now to clear out my fall decor to get ready for Christmas. Can wait to have some fun! I love Whole Foods Market. They’re building a bigger and better store in my area and I can’t wait for it to open in the spring! I love all the variety of produce I can find there! Have fun chucking your hubbard and Merry Christmas! My son bought one to carve for Halloween. No way! I kept telling him not to just get rid of it but of course he threw it out. I made him bring it back in but it’s a good 25 pounds and since I’m disabled I was wondering how to open this biggie. My son, who calls it a “ginormous blue turd,” will love dropping it on the ground. I’m glad to hear that you were able to rescue your hubbard. Happy turd smashing! I just poke a couple of holes in it and then stick the whole squash in the oven until it is soft (1.5+ hours at 350). When I take it out itis easy to cut and get the insides scraped out. It seems like a lot less work, safer and cleaner. Thanks for the idea Allie! I’m just curious, do you find cooking the hubbard with the seeds in affects the flavor? Thank you so much for your post! I accidently bought a blue hubbard squashin the spring (it was in the wrong section and I thought I was getting a thrid zucchini plant). I can’t believe how big they already are in July! Looking forward to harvesting and eating them this fall. LOL I can imagine your surprise when this behemoth just kept growing and growing in your garden! I hope you enjoy your fruit this fall! Hi Naomi! Blue Hubbards are typically harvested in the fall around the time of the first frost. If your squash is turning yellow I’m guessing that they’re sick plants. I’m wondering if the soil was too wet this season. I don’t know where you’re located regionally. I live in the north-east and this season was unusually wet. Your plants may be suffering from mold. Some sort of bacteria or virus infecting your plants also comes to mind. I’d rip the entire plant up and dispose of it (don’t compost it). Next season try planting in a completely different location in case the offender is still in the soil. If I want to freeze my blue hubbard squash in large pieces should I roast or bake it first before freezing or just blanch it. Hi Peggy! It depends on what you’re planning on doing with it after you defrost it. It your planning to use it like fresh squash I’d blanch it just long enough to make it soft enough to safely cut away from the skin. I’d then cube it to your desired size and freeze it in freezer safe bags. If you’re planning on using the squash like a pumpkin puree I’d roast it, puree it, and then freeze it. I hope that helps! I was just introduced to this BAD BOY a few days ago. I love squash but it seems so many of them are a little watery. 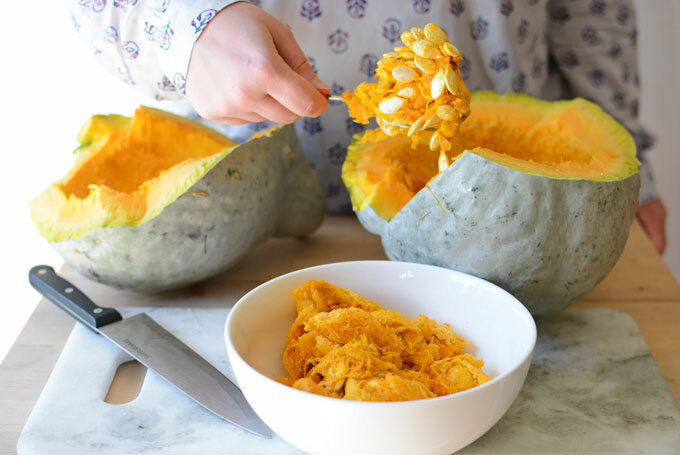 I tried this Blue Hubbard Squash and I am blown away by it! Best squash I have ever had! Thick, not watery! 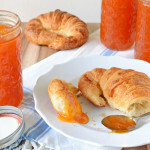 Taste is wonderful! I did cut (yes cut) it open before I read your post and did manage it without losing any limbs or digits in the process. Thanks for the great SMASHING tip. I had never heard of it or seen it before, but I mentioned it to my Dad and he was somewhat familiar with it but said he had never tried it. Will he be in for a treat! I am hoping that I can just let a few (I know, they take over) of these seeds dry naturally and plant them next year. Any thoughts on that? I know they are not a hybrid as they have been around for a very long time. Would I be smarter to just order an heirloom variety? I like the idea of doing my own. Thanks!! Sherry- I’m so happy to hear that you still have your hands and fingers! To be honest with you, I’ve never saved my own seeds before. Mainly because I’m afraid of it not working out! I did look up the process for you though! For squash you first gently clean the seeds off. Next spread them out on a towel to dry. Dry them in direct sunlight for 3-7 days. Finally store them in an paper envelope in a cool, dark place.